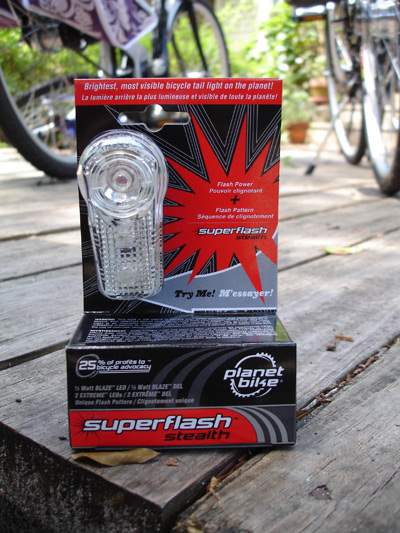 By now, most of you are familiar with the highly-acclaimed Superflash rear blinkie made by the great folks at Planet Bike. 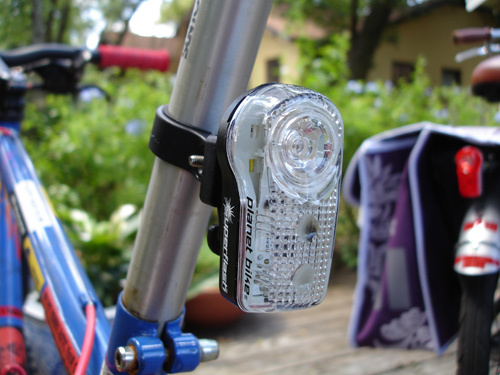 This blinkie is widely regarded as the best AAA-powered rear bike light on the market, hands-down. Same great light, with a 1/2 watt Blaze red LED and two smaller eXtreme red LEDs. The rubber gasket sealing the two halves of the light has been improved, too, after some rider feedback suggested that the original gasket allowed water into the case. The Superflash has a unique light pattern, and it is truly DAZZLING. Moe did a rear light comparison back in December, and his article included a video that demonstrates just how powerful this little light is. Check it out here. This light is going to look fabulous on my super-stealth weekend commuter…a flat olive-green and black Trek 460! One thing I should mention about Planet Bike…besides their support for bicycling (donating 25% of their profits to bike advocacy), they are really nice people who care about their customers. I ordered some replacement seatpost and rack brackets so that I could fit my old and new Superflashes on my fleet of bicycles, and when I placed my order the rear rack brackets were out of stock. Not a problem…I’m patient. A day later, Chris Follmer, ordering and customer service guru for Planet Bike, sent me an email stating that he found a spare bracket floating around their warehouse, and he just threw it into my package free of charge. Last time I ordered something from them, they tossed in some free stickers, too. Awesome! Check out Planet Bike’s complete line of products…from powerful headlights to amazing blinkies to fenders, racks and just about everything else a commuter could need! I love Planet Bike. They make great products, they support advocacy and they’re greening their business practices. Marrock, I wish…no discounts for goodies, unfortunately. Believe me, I would TOTALLY take advantage of that! Planet Bike makes better products than most, cheaper than most, and donates far more than most. What’s wrong with the rest of the business? Another great thing Planet Bike does: when you order replacement parts like mounting brackets, they do not charge shipping or handling. They want you to replace small parts rather than replace an entire light, so that’s how they encourage you to do so. To encourage you to rebuild your stuff rather than toss it in the rubbish bin, we offer free shipping on all spare parts. I’ve used one of these all winter commuting. It is absolutely a required purchase for early morning/late night commuters! I find that the clear lens-red “bulb” is easier to see b/c you can see 3 individual lights. Another bonus… it is in stock. I just ordered two. I mentioned you guys, maybe they’ll cut you a break in the future. Thanks Rick…if you haven’t used a Superflash before, you WON’T be disappointed! Roshal, I’ve got six Superflashes, both Stealth and otherwise…even a really old one with the original leaky gasket. None of them have EVER popped off or separated unless I wanted them to, and I’ve run them over some pretty tough conditions.